The college had to go to the B list. Southern Connecticut State University is currently hosting a “Social Justice Month” throughout the month of November to inspire students with “awareness,” “knowledge,” and “action” by inviting gun control advocate David Hogg, as well as by hosting seminars on racial and gender privilege. Throughout the month of November, SCSU is hosting dozens of social justice events focused on masculinity, cisgender privilege, LGBTQ+ communities, immigration, and racial justice. In addition to these events, the school is also promoting David Hogg, March for Our Lives co-founder and activist, and his “inspiring message” for one of its “signature events. 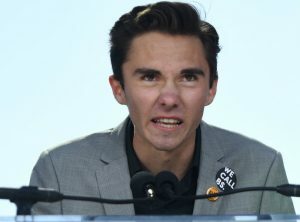 Hogg is being hosted on Tuesday to discuss how “grassroots activism and social media mastery have mobilized millions of young people to find their voice, speak out and engage in change.” The college does not appear to offer a pro-Second Amendment or gun rights perspective during the month-long social justice event. Students are also invited to create “zines,” a form of poster or flyer, to share their “message of dissent, protest, or vision for hope” with their friends or legislator. Other events during Social Justice Month include utilizing food and art with “diversity cupcake” decorating and an egg decorating event to display “how the eggs are different on the outside but on the inside are the same.” Students also have the opportunity to engage in “diversity painting” with colors that correspond with their identity groups. Several events promote the importance of social justice in education, inviting speakers to discuss “why teachers must be activists” and how to promote social justice in K-12 schools through policy and leadership.